After leading 2 straight come-from-behind wins, Jay Cutler is on his way to achieving the out-of-this-world expectations Bears fans placed upon his shoulders. And he’s doing it without an established NFL WR on the roster…or so we thought. Bear WR #1 – Lining up in the slot on 3rd down, WR #1 snags a short pass that’s high and behind him, eludes becoming a WR sandwich from two flanking defenders and scampers downfield for 19-yard gain to help keep a drive (and momentum) alive after Seattle took the early lead. Bear WR #2 – After the Bears D forced a turnover deep in Seattle territory, Cutler hits WR #2 on a short crossing pattern. WR uses nifty stop-and-go move to elude defender, then makes beeline for pylon. TD Bears. Bear WR #3 – On make-or-break 4th quarter drive, WR #3 grabs high Cutler pass in between 2 defenders and darts 36 yards for game-winning TD. For as good as Cutler was vs. the Seahawks (21-27, 247 yds, 3 TDs), his top 3 receivers deserve some kudos too. Earl Bennett (WR #1 above), Johnny Knox (WR #2) and Devin Hester (#3) are becoming a dangerous trio deserving of a nickname — how ’bout The Triplets? The Three Gees (like ‘The Bee Gees’)? Snap-Crackle-Pop? Windy City Trio? Chicago Speak3sy…okay, I’ll stop. The Bears offense is predicated on taking what the defense gives them. And when you have 3 WRs who are capable of making plays when their number is called, it makes life tough on a defense. And remember, we haven’t even mentioned Mr. Olsen, who gives the “O” the big receiving body that complements the speedy WR trio. Could this be the year the Bears finally have a 1,000-yard receiver? 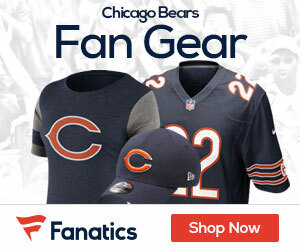 It hasn’t happened in Chicago since Marty Booker achieved the rare feat (at least for the Bears franchise) back in ’02. But why settle for 1 when you could have 2? And that’s something that hasn’t been done in Chicago since ’95 (Jeff Graham and Curtis Conway). So until the running game gets on track, the Bears will have to rely on their suddenly ‘potent’ passing attack. Wow, I can’t believe I just said that…without being sarcastic. 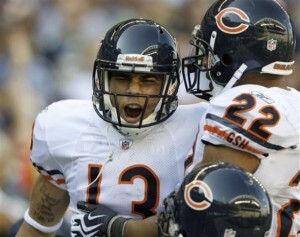 I challenge the Bears to give Johnny Knox more opportunities, for when opportunity knocks for Mr. Knox, Mr. Opportunity responds as “Johnny on the spot”! Again, I challenge the Bears to give Johnny Knox more opportunities, for when opportunity knocks for Mr. Knox, Mr. Opportunity responds as “Johnny on the spot”!